Burning the clavie is an ancient Scottish custom still observed at Burghead, Scotland, a fishing village on the Moray Firth, near Forres. 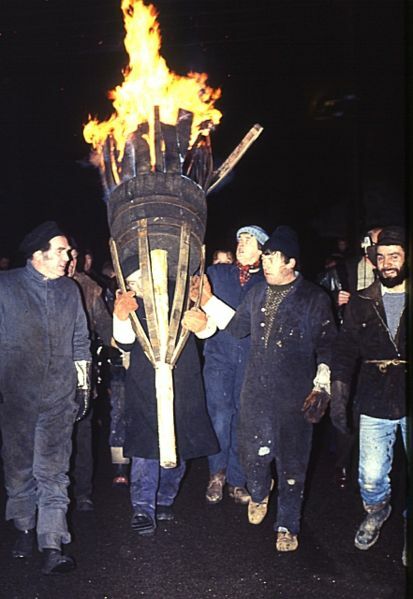 The clavie is a bonfire of casks split in two, lighted on 11 January, i.e. the first day of the year by the Julian Calendar (the original Hogmanay before the calendar changed in 1660). One of these casks is joined together again by a huge nail (Latin clavis; hence the term, it may also be from Scottish Gaelic cliabh, a basket used for holding combustibles). It is then filled with tar, lighted and carried flaming round the village and finally up to a headland upon which stands the ruins of a Roman altar, locally called the Douro. It here forms the nucleus of the bonfire, which is built up of split casks. When the burning tar-barrel falls in pieces, the people scramble to get a lighted piece with which to kindle the New Year's fire on their cottage hearth. The charcoal of the clavie is collected and put in pieces up the cottage chimneys, to keep spirits and witches from coming down.